This is the final post in a three part series. Please like, share and comment. Please click here for Part 1 and here for Part 2. Suppose you have a persistent group in your organization who has been completing its job the same way for a significant period of time. They refuse to change despite multiple suggestions on areas where the team could improve. Why will the team not accept the change? The group refuses to change because it does not see benefits of changing. Transforming an organization is a time consuming process and change agents will commonly go for the home run when implementing change. Spontaneously implementing a “large” scale change event every few years will lead to changes not supported by employees. Employees need to see the short-term wins, organizational improvement that can be implemented in 3 to 18 months. These short wins will create momentum and keep the organization engaged. Small: Small scoped, operational changes that are not dramatic changes to the organization. The scope of the change is contained in one function, department or level. For example, removing waste from your current processes (See my blog post on Organizational Hoarding for more). Medium: Medium sized changes commonly span more than one function, department, or level within the organization. For example, ...re-defining a new workflow that spans across departments like release processes. Large: Large scope changes span across numerous functions, departments and/or levels, involving a large number of people. These are changes that are radically new or foreign to the organization’s current environment or culture. For example, introducing new performance review practices, huge organizational structure/team/people design, a Fail Fast, Fail Often methodology, or continuous delivery/integration. In my previous blog post titled “Is change ever over? Do we need middle management?”, I discuss how an organization must move from sporadic transformations to an environment setup to continually change if wants to succeed in today’s ever-evolving environment. Implementing major change takes time. Organizations cannot continually rollout “large” scale changes one after another. This will lead to chaos. Instead, the change agents should implement a few smaller, operational changes in between larger, strategic changes. Implementing these smaller changes will give the change efforts immediate visibility, manage the resisters of change, and provide all three layers (i.e. top, middle, and operational)) of the organization real feedback about the validity of the change. More importantly, the knowledge the ‘change team’ will gain from working together on small ‘quicker’ changes will help them evolve to a more cohesive, stronger team. The change team will go through phases that all teams do. Bruce Tuskman defined the five step process that most teams follow to achieve high performance. Many newly formed change teams never progress beyond the first stage: forming. In this stage, team members are cautious, positive and polite. Some might be anxious with the new team members. It is imperative that the change team moves past this stage and onto the next stages quickly. The team will need to deal with its own dysfunctions before it can tackle the organizations’. The longer the change team remains uncomfortable with each other, the longer implementing change will take. Team members must feel comfortable enough to giving and receiving feedback. Rolling out change cannot be done individually, the team must roll out the change as a unit together. Change teams are a microcosm of the organization. They need to update their membership regularly to provide new insights, perspectives, and to adapt to the ever-changing environment. At the end of the day, the organization’s main goal is to continue delivering products or services, not implement changes. As change agents, your role is to make the implementation of changes as seamless as possible. Smaller sized chunks will prevent a large disruption in the workflow. The changes will allow the employees to grow accustomed to environment that is continually evolving, refocus the status quo and continue to make the organization deliver high value services. When implementing an agile transformation, do you start from the top or bottom of the organization? My experience has shown it is best to take a complete vertical slice of top, middle, and the bottom. “Organizational design is the methodology which identifies dysfunctional aspects of your organization’s workflow and realigns them to fit current business goals (and supporting values).” (Dr. Allen, 2012). The best way to align the organization’s workflow to fit the current business ways is an approach I call “vertical slicing”. Vertical Slicing is a holistic process where an organization is split the organization into small cross level and cross functional change teams. 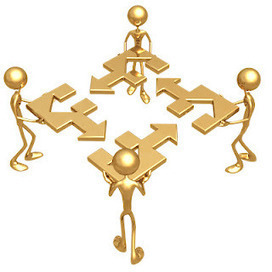 Each change team consists of members from each level of the organization (i.e. Scrum teams, middle management and executives). The organization will be moving together as all three levels will be involved in the implementation of change. Selecting a few of these teams as the change champions (pilot teams to test the change on), will provide you with a small sample of the organization to experiment with and test the interconnections between the different levels of the change. This is a cross-level approach. There’s an important distinction to make between a cross-functional approach and the cross-level approach. The cross-functional approach involves removing barriers between roles within the same level. For instance, an organization employing the cross-functional approach would share knowledge between developers, testing and QA. The cross-level approach involves removing barriers between different levels of the organization. For instance, an organization employing the cross-level approach would be sharing relevant knowledge between finance, developers, and post-sales. The vertical slicing approach encourages you, as change agents, to combine cross-functional and cross-level approaches forming teams of different roles and different levels. This will increase the variety of your change champions and limit the areas of the change that are not tested. Learning Paths: Employees will be able to interact with different facets of the organization. This allows them to experiment and learn. This will motivate employees as they will see the vertical slice teams as way to progress through the organization. Vertical slicing will improve the communication between the different levels of the organization thereby increasing the feedback loops and ensuring the middle management stays involved. The middle management's main role is to find the balance of where the organization currently is and where it wants to be. However, the middle layer is typically forgotten about as the change agents prioritize convincing the executives to implement the change and the Scrum teams to adapt the change. Without the middle management, there is a lack of communication between the organization’s executives and Scrum teams. Implementing vertical management will start the the transformation of your traditional middle managers into new middle coaches (Providing customer focus/empathy, company values, relationship/professional development). Vertical slicing will guide the organization towards a culture of innovation and leadership. Each “change team” will consist of different levels of the organization where each level will be interconnected and allow the change agents to validate their experiments. Yielding control of change validation from the individuals to the teams will push autonomy down and build an environment where decisions can be made at any level. Through my years of trial and error, I have learned there is no one size fits all solution to transitioning organizations to agile..context is king! Every model is based on different organizational contexts. Each model’s context has its own starting and ending point. There’s no guarantee that your organization is at the same starting point and aiming to end at the same ending point. Organizations commonly introduce (SAFEe) large agile models. A common misconception is if it’s big and prescriptive, it must be good! However, this leads to high disruption to the organization and a steep learning curve. This slows down the people as they must use new, foreign practices. The organization’s rush to become agile overnight by introducing a heavy weight model causes them to lose sight of the fact that the primary purpose of the organization is deliver products/services, not to be agile. When organizations transition to agile, they need to walk the line between gaining adoption of agile practices and continual delivery of their product/service. They do this by phasing their rollout as a series of experiential learning by groups of people who do the work. I have developed a composite model based off the works of Jason Little. This model is separated into small bite sized chunks that can be consumed in any order. You do not need to implement this model linearly. Once the impediments are identified, organizations should list out some possible solutions and identify success criteria for each impediment. Next, they can run experiments to test each proposed solution and solve them incrementally. The solution to the impediments may not be found from the first experiment. It might require several trials until the desired outcome is found. This model is fairly generic intentionally. There’s no magic formula to solve how to make your organization agile. Every organization is different and will be facing different impediments. It’s up to you as the change agents to determine what those impediments are by encouraging small, incremental changes and prioritizing the people ahead of the processes and tools. Organizational Agility is a journey, not a destination. This is the first post in a three part series. Please like, share and comment and I’ll be sure to update you when the next post in the series comes out. Is change ever over? Do we need middle management? Is there a way to help organizations move from a Change Transformations mindset to a Continuous Change mind set? Traditionally, organizations implement large scale change events within their organization by spontaneously have an epiphany and transform every few years. The frequency of these transformations has rapidly increased from once every 10 years in the 1980s to once every two years in the present. Today, companies must sustain a continual change pace if they want to succeed in today’s ever-evolving environment. To achieve this, the organizations must prepare to be in a continually changing environment. This means collaboration at all levels, from executives all the way down to their development teams (or IT teams). Continual change helps make the uncomfortable - comfortable. When the executive level decides on an organizational change (e.g. going agile), the executives expect that once they announce it, it has happened. There is lag time between the decision and achievement. Agile is recommending to continually change. This explains why the change frequency has increased because we are moving towards a stream of continual change as the agile models that we’re instilling insist that we do. In any agile framework (e.g. Scrum), we’ve given the development/IT teams a structure where they can work cross functionally, to be able to inspect, adapt and continually change. Executives have traditionally held their weekly meetings where they collaborate cross functionally as they have oversight of the entire business and pivot due to business conditions. The corporation must be able to experiment, not just optimize. As change agents, we need to realize that the organization must continually change and set up a cross functioning structure for middle management. What we failed to do is create a structure for the middle management layer. There is something special in the middle. We need to create a structure in which they collaborate and meet regularly in a cross-functioning way. Reduces communication distance from executives down to teams delivering product or service. The middle management is crucial to the success of the corporation because they understand how all the functions of the organizations work and can find improvements to be made. They provide an objective higher level view and are aware of both the development team and the upper management’s goals. We need to utilize middle management. Not eliminate them. Agile has not provided a strong vision on what middle management does in an organizations. These managers (I prefer the term leaders) are champions and coaches. They are championing many of the changes and are the special glue between executive strategy and execution. They aren’t cogs in the organization’s wheel; they’re the ones that are going to help support/mentor/influence employees building a relationship, and drive change. As companies grow, the distance from the people building the product and the customer increases. The people lose sight of the customer they are solving problems for. They lose empathy and context. Middle leadership helps fill in that gap by keeping their people in the mind space of the customer. While building a relationship and satisfying their people’s need for inclusion, development and growth. Better congruence between strategy, short term goals and execution depends on having a regular cadence set up of cross-functioning middle leadership. The middle leadership and upper leadership must be working together to support the groups entering the change to achieve balance. Otherwise, there are two ways of working: the executives sticking to their traditional method and the development teams implementing the new method. The only way the organization will change is if the organization moves together and receive continually feedback from both parties. Middle Leadership has a major role to play in change. We need to help give them the tools to work in their new environment. They need to transition from delegation to enabling, managing to coaching, project monitoring to relationship building with their people, and translating work back to customer needs. In today's rapidly changing world of disruptive innovation organizations need to be nimble enough to support this. We are asking our workforce to do this by becoming 'agile'. We want the agility to quickly pivot and seize new opportunities. We want to deliver to market sooner. We want our employees to innovate and deliver highly complex work more rapidly. Today's organizations are moving away from large transformational events and moving toward doing continuous change. These organizations are flat. How do we create a culture that inspire employee engagement to enable these organizations to thrive in this continuous change? Agility is no longer just an IT or Engineering movement, it is something that the entire organization needs to embrace. For this to be effective and long lived it needs the full involvement of human resources, organizational leaders, and change agents. There is some thought leaders that are already forward thinking and creating events for all these disciplines to come together to align to this common purpose. The Spark the Change event held in Toronto facilitated this movement. In my last blog post - Scaling Engagement Agility, I voiced my concern Agilists (change agents) to think beyond scaling frameworks and tooling. As Agilists, we need to rethink and adapt our beliefs. For example, in the 1990s and early 2000's we took a strong stand on co-located teams. We said this was a critical for an organization to adopt agile. Although, co-location is the highest fidelity for interacting, it does not match trends in the workforce of home offices. The technology tools available for collaboration has narrowed the gap of communication challenges with distributed teams. This can help support the workforce trend of working from home or in coffee shops. Human resource practices need to adapt to this new fast-paced environment. They need to become 'lean', they need to become 'flexible', they need to become 'agile'. There is no longer a guaranteed long relationship between employee and employer. The balance of power used to be with the employer. The employer would be their only one for the duration of the employee's career. In today's world there is more of a balance between employer and employee. Our workforce doesn't look at getting a job with you and staying there the rest of their lives unconditionally. They see their job as a reflection of who they are, not merely what they do to earn money. Our employees will always desire to grow and evolve because of this connection between what they do and who they are. They have more opportunities available to them. No longer are they restricted by the geographic location. They have an ability to work for any organization around the world. The average worker today stays at each of his or her jobs for 4.4 years, according to the most recent available data from the Bureau of Labor Statistics, but the expected tenure of the workforce’s youngest employees is about half that. Ninety-one percent of Millennials (born between 1977-1997) expect to stay in a job for less than three years, according to the Future Workplace “Multiple Generations @ Work” survey of 1,189 employees and 150 managers. That means they would have 15 – 20 jobs over the course of their working lives! In this new equilibrium of power we need to treat our employees like potential customers. I always hear the phrase that we need to make it easy for customers to do business with us. I also contend we need to make it very easy for employees to work for us. So how do we create an employee centric atmosphere in this new workforce? We need to take a holistic approach in creating this employee centric environment. Dr. Philip A Foster stated, "It was predicted that by the year 2000 that less than 50% of the working population would be in full time employment. In 2011 the number was actually less than 45%. If we play that trend out, by the year 2040 it is anticipated that there will be less than 30% in full time employment." What are some things we can look at to connect with employees quicker and continually? Job models. How do we adjust this for the new rapid workforce? If we want our organizations to innovate and change, how can we lock down long term career paths? We still need some sense of how an employee will fit and grow within an organization but it doesn't make sense to make them so long and rigid. Instead of projecting their career for the next 5 to 10 years we should shorten the horizon to 2 to 3 years. We keep these as lean and flexible as possible. As your organization innovates and changes new roles and job models will arise. Keeping open and flexible models allows employees to see themselves in a continually changing organization. Training. How do we training budgets closer to the employees? How do we allow for more autonomy to the person of what they can choose for training? If the training can only be approved based on today's goals, how do we open our employees minds up to training that might help the organization pivot to new opportunities? We need to make these resources closer to the employee so they have more direct access. Performance reviews. In today's environment of rapid and continual change, I believe we need to accelerate from twice a year to continual performance reviews. Continual performance reviews are just continual feedback loops. These feedback loops are no longer just between manager and employee, but all the people that this employee interfaces with so they get this 360 continual view. This continual feedback allows for continual positive reinforcement, frequent course corrections, and initiatives as needed. Building a relationship with your people. Your regular touch points with your employees need to be frequent and about them. This is all about them, not their projects or tasks. Where do they see themselves? What's on their minds? What are they dealing with. If you are not doing this regularly, I guarantee that a recruiter from another company is. In today's connected world outsiders have access to our people and they know it's about them to steal them away. The whole organization needs to work together to retain their best talent and keep them engaged. No longer can there be disconnected independent initiatives working in silos. We all need to work together HR, Leaders, Agilists, change agents and others. I would love to hear your thoughts and what your organization is doing. To create Organizational Agility you need to find the harmony between People, Process, and Tools. Agile speaks of putting people first, however from my experience, people are the poor step child to process and tools. People should be the driver, not the passenger. Creating Organizational Agility means scaling the employee engagement to have and maintain the culture of a start-up. My experience in scaling agile across large organizations is that even when you put the right process framework and practices in place, you are still missing something. People are going through the motions but there is a lacklustre of excitement. They are 'doing' agile, but they are not 'being' agile. They don't have that passion to innovate the product or how they're creating it. People are the heartbeat of the organization. They are the ones who represent you to your customers. They are the ones that define you. Their skills. Their talents. Their passion. The intangibles that only they bring as a person. If you look at start-up they have very few processes and tools. However they have a collective passion to get product or service into the market place. This is because they have the people who are emotionally vested in a common goal. They know the 'why' behind what they are creating. They know what they individually contribute toward that goal. As organizations grow, or scale, they lose sight of this. They spend less time recruiting for the right people (focusing on the skills rather than behaviours), reduce training budgets, don't invest in coaching, and merely just lose regular touch points with their people. They try to replace this with process. Process can help people go through actions in a similar way, but does little to nourish that passion that motivates them to do something a different way, a better way. Why do we move away from focusing on our people? We know it works. Process can't scale the behaviours, talents, intangibles, or passion of employees. We need to foster people engagement in order to get bottom-up innovation. This will build the culture you need to support agility. Instead of process scaling, think of engagement scaling. Engagement scaling is how you build within your organization mechanisms to keep people passionate and purposeful. There is no silver bullet. This takes a lot of time and work. You need to build a relationship with the people. You need help them understand the problems you're trying to solve for your respective customers or market space. Building that customer empathy that helps them understand the "why" the company is doing what they're doing. The more they understand the problem the more collaberation and ideas to learn different ways to solve these problems. They get vested in the purpose. This relationship will make them feel more comfortable to propose and create innovative products and services because they are getting more insight from you. Continually share the organization vision. Explain how the organization is going to establish themselves in the marketplace. Build the excitement. Explain the values of the organization so that your people understand how the organization wants to be seen to the rest of the world. Connect the dots to how your department or team will contribute to achieve and embody this. Share your challenges...be transparent. This will help them feel connected to helping you solve these challenges. Most importantly, create a bond with your employee. Have a deep understanding and interest into their goals. What is their needs as an individual. How can you help satisfy those needs. Build a culture of 'fail-fast', learn, and make adjustments. Develop problem solvers. Let them discuss the challenges they are facing. Resist the temptation of giving them your answers to these challenges. Actively listen and ask questions to help them get a deeper perspective of their challenge so that they can come up with options to solve them. Your job as a leader is not to figure out everything, but to coach your people to figure out solutions to their own challenges. Help them reflect on what they learned when they tried something and it didn't work. When they have a win, share in their happiness. When they accomplish goals give them time to reflect. Have them reflect on what they've learned from the success. There is been countless studies that show that people are more productive when they feel the organization shares in their development and success. This is all on you as a leader. If you don't have time for this, question your role. Engagement Agility is developing leaders throughout the whole organization to create an ecosystem of continual engagement. How do you do this? I will be doing a series of blog posts digging deeper into the topic of scaling engagement and employee development in the agile world. I will share things I have implemented - pragmatic strategies to achieve this. I am calling this topic Engagement Agility. This is my passion that is inspired me to start writing a book on how to build this within large organizations. Authority – the power or right to give orders, make decisions, and enforce obedience. Influence – the capacity to have an effect on the character, development, or behavior of someone or something, or the effect itself. Authority is power. If you want to rule the galaxy by power, then join the dark side of the force. Influence is ability. If you want to lead the galaxy by working together with the citizens to solve the problems, then continue your training to become a Jedi Knight. Early on in my career I would always say to myself… If only he had the authority to make these things happen. It would be easy. I had some misconceived notion that being able to say what needs to be done would equate to those things actually being done. I would simply create a vision, tell the organization that they had to follow this vision and I can move on to the next challenge. As I progressed through my career I moved into positions with authority. My dream finally came true… I would not need to spend a long time campaigning to the mass number of people to get their buy in, I could simply give the marching orders. Although this helped change move quicker, it was not long-lived. The moment we achieved the goal or I redirected my focus to the next opportunity, the previous initiative would fall back to its previous state. Authority gives you immediate change but it's not long-lived. You can tell somebody what to do. They may do it for the moment. Unless they understand what the problem is that you're trying to solve and why you're doing it, they will not continue doing so after the change. Authority causes people to act on orders/tasks. Influence is working with people to understand and solve the problem collaboratively together. In dealing with organizational change, I have learned a great deal of what is needed to help move the critical mass from their current state to the desired state, and to ensure sustainability. I have had to develop a skill set to connect with people, build their trust, unleash their passion, grow their confidence, and move toward a shared vision. Being able to influence takes a lot of work. You don't get there overnight. You need relentless pursuit. The ability to be open to refine the vision as you get insight from these people. Give autonomy to those people affected by the change. Lead by example. Build long-lasting relationships. Earn respect. Influence is when others accept your ideas or direction. It means that people have internalized your message. They believe it. They might even be excited about it. Authority causes people to act on orders/tasks. Influence is working together to understand and solve the problem. For long-lived organizational change you need to put in hard work toward influencing the people. People are very habitual. To develop these habits it takes time. We do not quit bad habits, rather replace them with good habits. Make being a positive influence your habit. Having influence with others does not only make you a fantastic change agent, it also makes you an fantastic colleague. In future posts I will speak to this specifically in the context of Organizational Agility Transformations. Standardization and Autonomy - Can they co-exist? Companies have two avenues for growth: acquisition, or organic growth. Regardless of how they are growing their increasing size increases the difficulty of the company successfully responding to change. Retaining as much as possible of advantage of that small company’s ability to rapidly pivot can be a key element of a company’s success. In the past, large organizations were seduced by the notion of having a standardized process across all their product teams within the organization. I can understand the appeal of having one “best process” uniformly across the organization. However this appeal is based on a manufacturing paradigm of working with tangible items which does may apply in other industries. One other presumed benefit is a reduced cost of moving teams around the organization, but this is rarely realized because intellectual work cannot be mass produced. Having a standardized process across the organization forces process design to accommodate the lowest common denominator. It also takes a larger effort and time for the organization to be able to pivot and adjust to move as one entity because of the critical mass. From a people perspectives, employees feel like there a cog in the wheel and they're not motivated to improve how they work because they believe it is a big bureaucratic exercise (which it usually is in large organizations) that "other" people have bestowed down on them. This standardization comes at a huge cost for productivity and efficiency within the majority of the product groups. Giving product groups (and teams) autonomy empowers them figure out the best way for them to work as smaller units to optimize productivity and efficiency. Smaller teams can have shorter feedback loops and can inspect and adapt more frequently and progress more quickly. Smaller scope for process design allows them to optimize more precisely because it is based on a smaller set of skills, expertise, team makeup, and particular product/technology. From the people perspective, giving the individuals autonomy to define how they work, how to best optimize their own work leads to higher morale, motivation, and productivity. Even when the technology changes over time, giving the autonomy at the smallest reasonable unit allows them to rapidly go through and adopt the change quicker. It also allows each product group (and teams) inspect/adapt/change at the rate that is within their threshold and within the context of their business needs. Autonomy is one of the factors a motivation that Daniel Pink talks about in his book Drive. I think we can all agree that we want to motivated workforce. The downside of that autonomy is that the operations of the organization becomes less transparent. Or simply, make it more complex to be able to see if your organization is moving forward. Can you marry the two to get the best of both worlds? In my experience, YES! You can do this by loosely defining workflows and processes from the above at a very high level and . This way the organization knows that the highest level of the flow that goes through to deliver products or services. When product groups (even teams within the groups) create their own processes and practices they do it and to detail out between the boundaries that they have to play with. The organization themselves reports on the high level processes to be able to monitor how all the work is progressing to be delivered. Each product group can define their own product group practices and processes for all the teams within their product group, trying to define them at the highest, but still responsible level to allow individual teams discern autonomy and how they specifically meet those. A good example would be The Definition of Done. The organization will have guidelines that they want all their products and services to ensure encompasses what they call a releasable product. Each product group will have their level of definition of done that meets their particular products needs in order to transfer the product is ready to be released to the market. Furthermore, each team will have their own specific definition of done that addresses all of the above in any specific things that they feel they need to do to produce releasable software. This should help ensure transparency from the top down. This also allows for easier updates at the appropriate level without it being all or none. One thing that I did not mention in this post, is that this hybrid will cause more work for external auditors because they will not have one central place to review the processes. However, I would rather put the burden on a few than many of the organization. The regulatory auditors are going to have to just the way in which they audit software companies going forward to meet the new agile paradigm. This is just one of the scaling mechanisms that I have seen prove successful. I will be sharing more and hope to hear back from you about techniques that you have used in scaling agile across a large organization.